When the now Mrs Weir came to me last year and asked if I would design her wedding stationery I jumped at the chance as it would be Love Invited’s first official bespoke order. Their theme was black tie and hearts, with a touch of pink. So I worked on some beautiful stationery to complement. The invitation was a black wallet with a set of cards slipped inside which included the invitation, rsvp and additional information. The wedding invitations were all finished with a length of fuchsia pink ribbon and a tag with their own personal heart shaped monogram. All the other stationery items followed suit, including table menus and hotel information cards, that were placed in all the guests rooms to give them details for the weekend. The place cards followed the tag design but were black card threaded with ribbon that were hand written and tied around the favours. As for the table names they were all based on couples form neighbours as they met when they lived across the hall from each other. The newly wed Mr & Mrs Weir were married over the Easter weekend at Ballygally Castle, County Antrim in Northern Ireland. It looks like they had a fantastic time, here’s some photos to prove it. 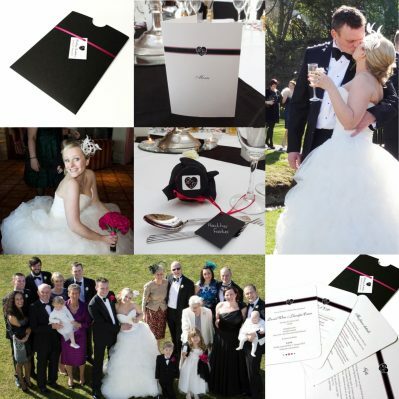 If you are interested in bespoke wedding stationery please do not hesitate to get in touch. At Love Invited we can work to any requirement and budget.